(Um, same) + see who else he's catching from the crowd! Perhaps the only modern folk rock band that can truly take you to another place that's, at the same time, somewhere totally new, Dawes have continuously proved their position in the genre since their debut in 2009. 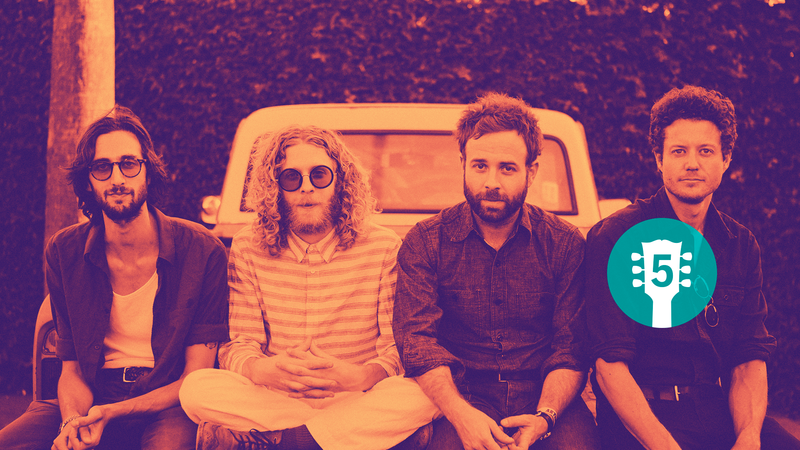 The band—Taylor Goldsmith (guitar, vocals), Griffin Goldsmith (drums), Wylie Gelber (bass), and Lee Pardini (keys)—have toured with the likes of My Morning Jacket, Bob Dylan, Mumford & Sons, and Conor Oberst, solidifying their name on live stages everywhere. That's exactly why each and every one of their fans felt like the band's personal Valentine when, on February 14 this year, Dawes dropped a surprise live album entitled, We’re All Gonna Live. 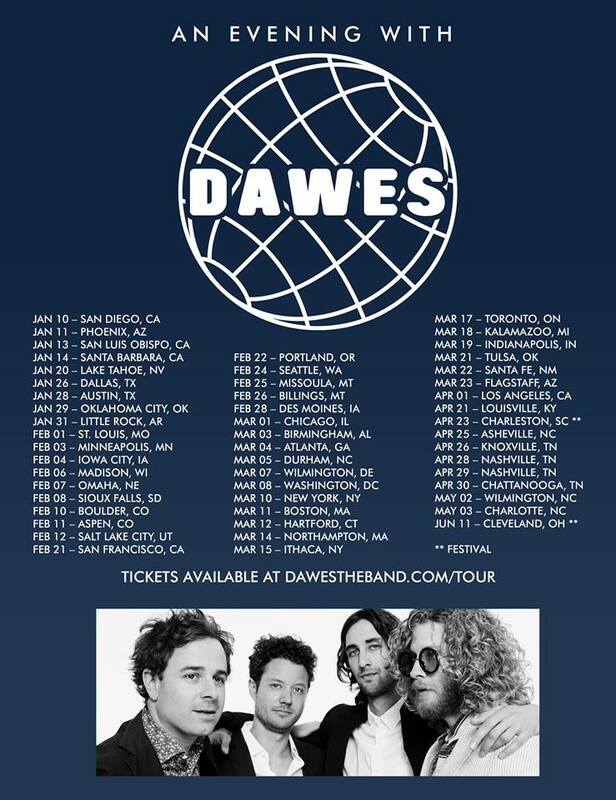 If you were able to catch the LA rockers on their first four dates of their 2017 “An Evening With Dawes” tour (San Diego, Phoenix, San Luis Obispo, Santa Barbara), you were lucky enough to see the tracks on the album performed right in front of your eyes. Not so lucky? The record is only available for streaming, which means you can listen now (see below)! PS, you're going to find a phone number on the album cover, call to leave a message for the band while they're continuing their tour through beginning of May—no, seriously. With all this talk of live music from Dawes, we were super curious as to who they want to catch from the crowd this year. There's no doubt they've had the chance to watch some incredible sets by their tourmates over the years, but keyboardist Lee Pardini filled us on who he can't miss live in 2017. Find his top five picks below, and Track all the bands. Then Get Tickets to see Pardini and Dawes perform while you still can. "They are the funkiest. Period. Their live show is equal parts super-groovy, hilarious, and extremely musical. The amount of talent in the band is heavy, but it never distracts me from sinking into the nasty grooves they are laying down." "Omar blends beautiful melodies with hypnotic rhythms. Every show of his takes you on a journey and it's definitely some of the most beautiful music out there. He also mixes in some Spanish language songs, making for some of the most dynamic live sets I've ever seen." "This group is a total powerhouse. Holly and Jess' vocals will blow your mind. I try to catch them whenever I can because the live show is so damn good. Guaranteed - it will move you." "It's no secret that Meshell is a legend. She is constantly progressing and challenging your expectations. A true individual. Her band is also full of totally deep players and the live shows are all about the highest possible musicality/individuality." "His album Malibu is blowing my mind. I've only caught a partial set from afar - but I'm dying to check out an entire show. It's so groovy it may just cause me to dance, and that takes a lot."